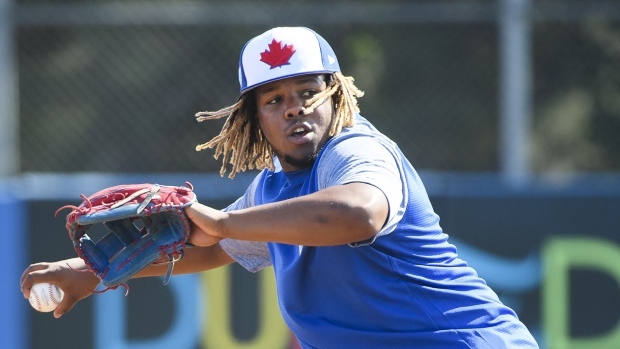 It looks like Vladimir Guerrero Jr.'s recovery is going well. According to manager Charlie Montoyo, Guerrero is "ahead of schedule" in his rehab and has even started doing cage work. Montoyo added that the tentative plan is to keep him in extended spring training and then head to Triple-A Buffalo assuming he has no setbacks. Despite the good news, there is still no definitive timetable for his return or his call-up to the big leagues. Guerrero has been out since mid-March with a Grade 1 strain of his left oblique and was originally expected to miss about three weeks. He hit .211 in six spring training games prior to the injury. Meanwhile, the Jays named right-hander Trent Thornton as the team's additional starter on Tuesday. He will fill in for lefty Ryan Borucki, who is expected to start the season on the injured list and miss at least one start because of elbow trouble. According to Montoyo, Borucki played catch and will likely take it slow with his recovery. Trent Thornton will start the fourth game of the season on Sunday, with Clayton Richard rounding out the rotation Monday in the opener against the Orioles. Montoyo says that was based on lefty/righty matchups with O’s/Tigers. Thornton will start the fourth game of the season on Sunday, with southpaw Clayton Richard rounding out the rotation Monday against the Baltimore Orioles. Sam Gaviglio has also made the team but he is expected to pitch out of the bullpen. Veteran Clay Buchholz will be an option in mid-April after signing with the team late into the off-season. Thornton pitched to an earned run average of 4.80 in 15 spring innings spread out over seven appearances. He was acquired in an off-season trade with the Houston Astros in exchange for infielder Aledmys Diaz. Toronto will close out their spring training Tuesday night in Montreal as they wrap up a two-game set with the Milwaukee Brewers. The Jays will open the regular season at home on Thursday against the Detroit Tigers.